It’s a transcript of The Crystal Maze episode. Hurrah! Gary: … but you stick them in things, sire. Nott: [irritatedly] Yes Gary, that’s presumably why they’re called stickers but what are they actually for? Graeme: Well nothing sire you just collect ’em! Nott: Don’t be ridiculous you’d have to have the mind of a particularly thick two year old to fall for that! Graeme: AND the entire cast of that popular Australian soap Nice People Whose Huts Are Next Door to Each Other. Gary: He’s going to be really chuffed with these Great Torturers of Scunthope! [Hooded figure knocks Graeme out]. Gary: Hobbies are fun, sire! Marian: Hi everyone, I’m back! Marian: I said I’m back! Guess where from. Barr: Hang on, we’re doing Chronic the ‘edgehog.Ron: It’s the first time we’ve got to level four, isn’t it Chronic? and he hasn’t been zapped by the crabs [shakes a crab] once yet! Barr: Nah, but I ‘ave. [A crab drops on him]. Ooh! Barr: Yeah, your bum’s getting a bit big. Marian: I mean my hair! Rabies: Oh you’re gonna dye your hair! Robin: Hey guys what’s the problem, earwigs in your knickers again? Marian: No Robin it’s my new image – a fashion statement for the 1190s! Long hair’s for little girls, right? Robin: I don’t think so actually. Huh, not more stickers. Put them on the booty pile would you. Barr: That’s it, game over my turn! Robin: Well I’m glad you asked that. Now, in order to get to the first level – which is the tea level – you have to solve this really hard riddle. and Ron will be the “Enchanted Guardians of the Tea Tray” OK? It’s Dungeons and Dragons. You’ll love it. If you want your tea, you’ll have to ask the guardians three questions but one of them always tells the truth and one always lies, and you don’t know which is which. OK? You’ve got three hours… from now [upends a large sand timer]. Marian: OK… first question: Barrington, will you pass me that box? Robin: You haven’t really got the hang of this, have you? King John: [slams table] …AGAIN? Nott: ‘Fraid so my lord. 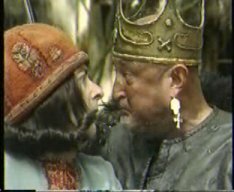 King John: Then you’ll just have to go back to Scunthorpe and get some more, WON’T YOU? Guy of Gisbourne [Guy hereafter]: I’m bored! Nott: [talking to his guards] If only we could find another way to get there! Gary: What about an enourmous flyover? Graeme: No, you’d never find a fly big enough! Guy: I’m bored I’m bored I’M BORED I’M BORED I’M BORRREED! Nott: [irritatedly] Something the matter, Guy? Graeme: I think he’s bored sire. Guy: I might as well just dig a big hole and bury myself. King John: There’s a shovel in the toolshed! Nott: Wait a minute! What did Guy just say? Gary: I think it was [does impression of indeterminable whinging]. King John: Some rubbish about digging a hole. Party on my lord! We’ll dig a hole! We are going to build the world’s first cross-forest tunnel! Guy: You’re squeezing your spots, aren’t you? Rose: No I haven’t got any spots. Guy: You’re Spottiest Spot the Spotty Puppy! than a million spot the ball competitions! Rose: It’s truth. I could do with a facial. Guy: Spotty! Spotty Botty! Big Fat Yellow Spotty on Your Nosey-Wosey! Rose: [reading] Worksop Health Farm. Get rid of those unsightly blemishes with our exclusive mud treatment. Only… they must think we’re made of money! Guy: Nobody takes any notice of me! They’d be really sad if a big bad robber with horrid breath came over and kidnapped me, wouldn’t they? They’d miss me then and have to pay thousands and thousands of pounds to get me back and it would serve them right! Rose: [lightbulb] Yes it would, wouldn’t it Guy. Shall we teach them a little lesson? 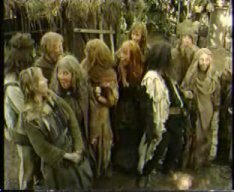 Nott: People of Worksop, I bring glad tidings! Your village has been chosen as the entrance to a wonderful new tunnel. Nott: From now on, you will be able to go on fantastic holidays to exotic faraway places! Nott: Or off on shopping sprees, to buy disgusting looking sausages, and cheeses that smell like a skunk’s armpit! 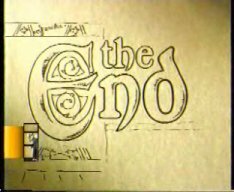 Nott: [to Graham] It’s going rather well, isn’t it? [to Villagers] It will be a tunnel… to prosperity! will be coming over ‘ere, will they? 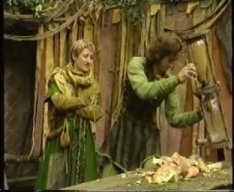 Gladys: They stink of garlic! Snooker: And then there aren’t any left for us! Gladys: And they’ve got funny little mouths like this [does an impersonation]. Snooker: And piggy little eyes like this [does an impersonation]. Gladys: And they’ve got two heads! Villagers: NO TUNNEL ‘ERE! NO TUNNER ‘ERE! Nott: [to guards] I’ll say one thing for the English, they love foreigners don’t they. Rose: …Or you will never see him again… signed… Maid Marian. 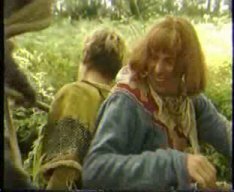 Guy: [tied to a tree] This is a good game isn’t it! Rose: It’s not a game, Scab Brain. Guy: They’ll have to pay loads of money won’t they and they’ll be really sorry and love me forever and ever! Rose: Oh shut up Guy! Rose: A gag I think. Rose: [puts gag in mouth] SHUT IT! Now, I won’t be long. You be a good boy. And don’t run off, will you? Marian: I mean it was a practical decision. My hair used to get twisted round the flights of my arrows, see? A couple more ambushes and I’d have been as bald as a coot on this side. Robin you’re not listening are you? I know not this Robin of whom you speaketh of… I am the Gamesmaster! Marian: What, one of those sadists who make you run round the playing fields ten times because you forgot your PE kit? Robin: Not that sort of games master. [puts on voice] I am The Gamesmaster! This is Aragard the Fair [Little Ron comes out from under a flap], Prince of Justice. Bazeroid the Crucial, Happenin’ Dude of the Dark [Barrington comes out]. Rabies: Who am I again? 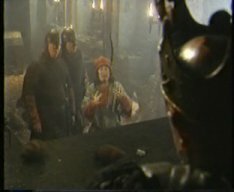 Robin: We’ve prepared a test for thee, Damsel, that will tax thee to the limits of thy ingenuity. Two sacks – one is full of rocks and is as heavy as lead the other is full of feathers and is as light as… as a feather actually. Now, without touching the sacks can you tell me which is which? Marian: Aragard? Pick up that sack would you? [Ron strains to pick it up] Now, hit Robin over the head with it. [Ron swings it at Robin and knocks him over] That’s the one with the rocks in! See you later! Robin: You have to spoil everything, don’t you? Nott: Good Lord, how did that happen? Well it’s the ground it’s harder than a GCSE maths paper written back-to-front in Japanese. We’ll never dig a tunnel here sire. Gary: But it will take a million years, sire! Nott: Oh, it gets later every day doesn’t it, give it here. 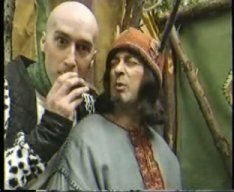 Dear Sheriff I’ve kidnapped Guy blah blah blah, a thousand gold pieces or you’ll never see him again, signed Maid Marian. Hah! Serves him right (screws up note and chucks it behind him) Listen! You know I believe in calling a spade a spade don’t I? Nott: [handing him spade] Well get digging or I’ll pin your ears to that tree. [A villager puts up a poster saying “We don’t DIG the tunnel” in the 1970s stylee] Push OFF. Marian: [annoyed] …dungeons and dragons. Honestly, about as exciting as a game of charades with your deaf auntie. It’s a funny game! Rose is kidnapping me so she can get lots of money and have a mudpack and have all her little wiggly hairs pulled out. Guy: Yes! And the really funny thing is, is that she’s pretending she’s you who is doing the kidnapping! Marian: Well! In that case I better had, hadn’t I? Come on! [starts untieing Guy when an arrow zooms by and sticks in a tree just missing Marian] Argh! Rose: Don’t move a muscle, sonny. Oh it’s you Marian! I thought it was a fat schoolboy with a bad haircut. Marian: Don’t be so childish Rose. Um, it is Rose isn’t it? Only I can’t quite tell because of all of the blackheads! Marian: (screams) Don’t do that! Unseen backing singers: Do the Double Trouble! Together: Get down! Get in a huddle! Do the Double Trouble! Together: It will never e-e-end. Together: Jump in the air… you get in a huddle [Marian ties Guy and Rose up, Guy escapes]… You sit right down, you’re tied right up it’s called the Double Trouble. Everyone: You jump in the air, jump in the air and you get in a huddle, get down get down get down! Do the Double Trouble! UBS: Do the Double Trouble! Together: Do the Double Trouble! Everyone: Get down get down get down! Do the Double Trouble! Marian: Ooh, serves you right! Guy: Serves you both right! This is fun isn’t it! Bye! [Guy runs off]. Nott: So exactly how deep did you actually get? Errr… quater of an inch, sire. Mmm… we should be in Scunthorpe by July… 1996.
sire. They’ll have invented these huge flying horses and carts that’ll get you from Scunthorpe to Gatwick in under half an hour! Nott: Don’t be ridiculous why would people want to go to Gatwick, to watch the queues on the M25? Well that’s it then, no tunnel. King John: Whaddyamean “no tunnel”? Of course there’s going to be a tunnel, I sent out all the invitations. This afternoon my sister Queen Eleanore is digging the first ceremonial sod and make sure Guy looks as if he’s having a good time, if his mother’s coming. Gary: I wonder how Guy is? Nott: Quick! We’ve got three hours to find him otherwise we’ll all be looking for a career move. Gary: I wouldn’t want to move to Korea! Robin: [still dressed as The Gamesmater and still doing the voice] She’ll never do this in a million years! The Maze of Mystery, a catacomb of tunnels and tests and in each room a fabulous prize! Rabies: I didn’t know we had any fabulous prizes. Robin: Yay oh Grungesplatter. See here, the Pizza Portion of Wisdom. Ron: Eugh, it’s got something disgusting on it. Robin: Nay Aragard! This be the Slug of Immortality! And lo! Here! The Spaghetti Hoop Of Being Able To Talk Lots Of Foreign Languages With A Really Good Accent. Here! Take these gifts, and proceed to your rooms, I the Gamesmaster will guard the door. Barr: Whassin there then [motioning at a room]? Ron: Whose gonna be that then? Robin: [dropping voice] Ah, problem. We’ve… we’ve run out of people haven’t we? 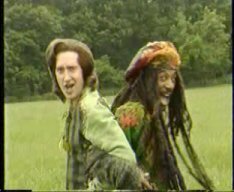 Guy: Oh goody woody as a scrumptious puddy! Dungeons and Dragons! Can I play? Snooker: And these two ‘eaded Scunthorpians will come swarming through this tunnel like… like big swarmy things! Do we want that? Villagers: [holding up signs] NO! Marian: Oh I don’t know, but it will make waxing your legs seem like a picnic! Snooker: We few! We muddy few! We band of peasants! People of Worksop! Snooker: Argh! There’s one of ’em ‘ere already! The smelly Scunthorpian! Quickly! To your positions! Marian: Yeah, I wonder why. Now untie me please I’d like to go home. Rose: And what about me? Rose: Well! Look at me! Marian: Oh yeah! I’m so pleased you got tyour mudpack after all didn’t you, and it didn’t cost you a thing. Gary: I hope he turns up soon sire, I don’t want to miss the ceremony. Nott: If he doesn’t you’ll soon be missing both arms, both legs and several important internal organs. Robin: [a distance away off camera] Now all we all in position? 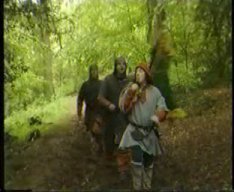 The Merry Men: Yes O Gamesmaster! Robin: And the Giver of Gifts? 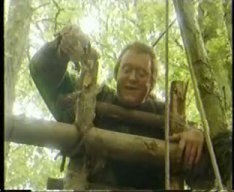 Guy: Ready as a teddy, Gamesmaster! Robin: Stop nibbling that pizza! Nott: OK Hood… where’s Guy of Gisbourne? Robin: SO! You would try your luck in the Maze of Mystery? Gary: Er, if you like! [Robin takes off Gamesmaster garb. 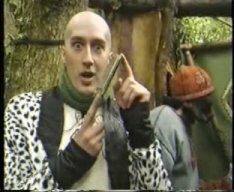 He’s now got a bald head and a leopard-print jacket, like Richard O Brien in The Crystal Maze]Robin: So, what do you reckon? Long hair’s for little girls, right? [plays harmonica]. OK! Let’s play some games! Robin: OK, what sort of game: physical, mental, skill, mystery? Graeme: Have you got table tennis? Robin: Mystery, right, who’s going in? Robin: OK you’ve got two minutes, two minutes from the moment I shut the door. In you go! [There’s a balancing pole and a mud pit]. Graeme: Ah, there’s a beam leading to slug with a big red arrow pointing at it… what do we have to do! Gary: How do we get across? What are we supposed to do? Nott: Look it’s obvious! You get on the plank and you grab the slug [Robin holds up the harmonica to camera] although Heaven knows why. Robin: Tick tock tick tock [plays harmonica, looks at camera]. Nott: Do you mind not doing that please? Gary: I hope there’s no pirahna fish in ‘ere, or octopusses. Graeme: What? Can’t hear you sheriff! Nott: GRAB THE FLIPPING SLUG! I can’t believe I’m saying these things. [Grabs slug] Got it! It’s quite sweet really! 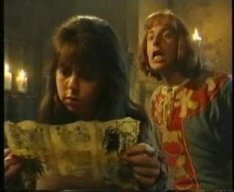 Robin: Dear dear, they’ve dropped it! Round here, round we go! Don’t dawdle! Right chaps, this is a skill game, two minutes, in you go! Nott: What is it? Come on, WHAT IS IT? Gary: It’s a jigsaw puzzle isn’t it? 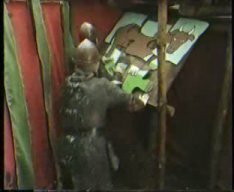 Nott: I KNOW IT’S A JIGSAW PUZZLE GARY, What of? Gary: A vase of flowers? Robin: Not close enough I’m afraid! Bazaroid! [Barrington empties a large vat of red gunge over the guards. They come out of the room. Robin plays harmonica] Never mind! Onward and upwards as dear old Mummy used to say! 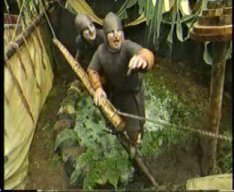 [Guards pull levers, each one releasing a different colour gunge over them, the third and final one releasing a ton of feathers]. Robin: Well! So far you’ve won no prizes but all could change in this final room… [Robin opens door, Guy is sitting at the far end]. Robin: Right you’ve got two minutes from the second I close the door. Nott: Hang on, I’ll play this game. Nott: No THIS [grabs Robin] is what I have to do. 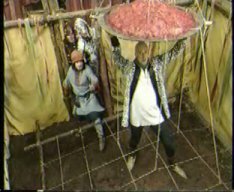 Now you get under that plate and hold onto it because if I trip over any of these ropes and end up with half a ton of strawberry jelly on my head then Robin O’ Hood will wind up as a doner kebab OK? Guy: Hello Sheriff, I am the Giver of Gifts. so put that rubbish down and let’s get out of here quick. Guy: It’s not rubbish! It’s the Used Tissue of Invisibility! Nott: Don’t lie, it’s a snot rag. Come on! Robin: That was really sneaky! Marian: What’s all this? Are you mad? Robin: No. We built this fab series of mystic rooms, see! Marian: Well you can just unbuild them. Honestly, you’re like little kids. [Walks into still trapped room]. Come on, you can start in here. Rabies: Hello Marian, had your hair done again? Nott: Stop dawdling, your mother will be waiting. Guy: [excitedly] Mummy’s here! Hooray I’m going home! Nott: Hang on, give me your tissue. 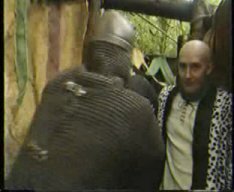 I’ve still got a spot of custard on my codpiece. Guy: It’s not just a tissue! Nott: Yeah yeah, it’s the Used Tissue of Invisibility I know. Gary: That’s so typical that is. We run around getting covered in gunk and feathers and HE gets the only tissue. Gary: [holds up “Guards are people too” sign] It’s my notice. I’m handing it in. Graeme: Gary… that’s a bit drastic. Why don’t we send him to Coventry instead? Graeme: No no no no no. Ignore him. Pretend he doesn’t exist he’ll really hate that. Gary: Right. [chucks away sign] You’re on. Nott: Honestly, that boy’s about as bright as a two watt bulb in a power cut. Hah, do you get it, that means he’s not very bright at all, see. [Guards walk straight past] Hello? Am I not here? Have I ceased to exist? Am I completely invisible? [Stares at rag] Haragh! It works! They can’t see me! They can’t hear me! It flipping works! 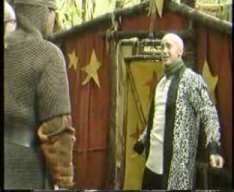 King John: Alright alright you win! I’ll hold an inquiry. Snooker: Will you your majesty? King John: Yes! I’ll ask everyone in Worksop if they want a tunnel and if they say no, I’ll chop their heads off. Snooker: Hmm! Can’t say fairer than that! Gladys: You carry on your majesty. Thank you. I’ll hand you over to my sister, the beautiful Queen Eleanor, who will now lift the first sod. Queen Eleanor: I’m not lifting anything until I’ve seen my dear little boy! Guy: Here I am mummy! I’ve been having a lovely time! I’m so excited my armpits are all pongy! 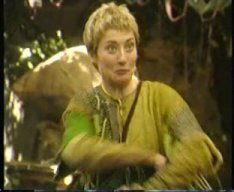 Queen Eleanor: Ooh! Isn’t he sweet! Nott: Yes, as sweet as a skunk curry. Sorry we’re late Pigface but your stupid son got kidnapped [blows raspberry, Queen is shocked, look of amusement on guards faces, shock on King John]. It’s alright! She can’t see me, I’m totally invisible. See! I have The Used Tissue of Invisibility. Snooker: See! He has The Used Tissue of Invisibility! 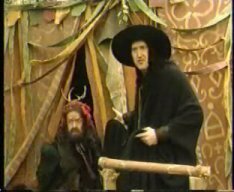 Nott: [wanders over to King John] So I can say what I like, can’t I you jug eared, half witted moron with the breath of a dead goat and a bottom the size of North Yorkshire! Nott: Yes! By the way, there isn’t going to be any stupid tunnel. Guy: This is funny isn’t it Sheriff! I’ve actually got the original script of this episode, having won it on eBay earlier this year. Nicely done! If there are any interesting differences, please do tell. Great transcript of the episode, can’t wait to see it when it comes out on DVD later. Did anyone notice though how they have a Hertfordshire town mentioned in the script? Wow! Never knew they knew the town of Letchworth like me, as I used to know that town very well!